To celebrate February 2nd, Casa Tuesday style, evening prayer recounted the first sodality of Bordeaux who made their commitments on this date in 1801 (read excerpt below). 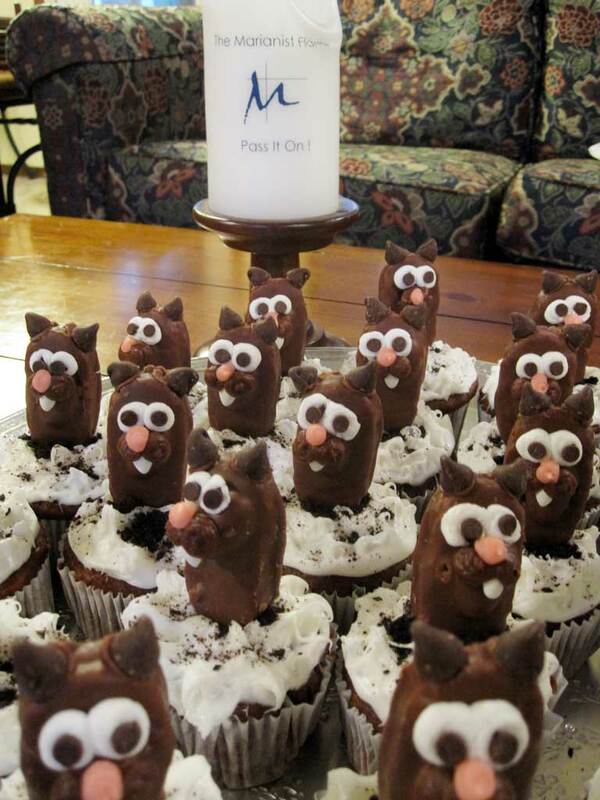 A simple supper followed with a special dessert: groundhog cupcakes! Groundhogs (Almond Joy candy bar, Tic Tac tooth, chocolate chips and colored frosting) sit atop “Black Forest” flavor (German chocolate and cherry cola) cupcakes frosted in vanilla snow and crushed Oreo cookie dirt. On the feast of the Presentation of the Lord, February 2, 1801, Father Chaminade gathered with the first group of lay Marianists to profess their commitment to the mission of Mary in bringing about the presence of Jesus in the world. I, servant of God, child of the Holy, Catholic, Apostolic and Roman Church, dedicate myself to the service of the blessed Virgin and to the cause of her Immaculate Conception. I promise to honor Mary under the title of Mother of Youth and to make her honored by others as much as is in my power. May God help me and may these holy Gospels give me strength. Each one, beginning with Father Chaminade, himself, signed the Act of Consecration in Bordeaux, France, inside the small oratory of the Immaculate Conception. There were 12 of them and, like those first apostles of Jesus, represented a cross-section of society: teachers, students, a salesman, laborers, a shoe-maker, a manufacturer of playing cards, a cleric. Within five years, this group grew in membership to a few hundred men and women. By 1810, a number of young men and women of this group were looking for some form of religious life as Marianists. In 1816, a handful of young women, including Adele de Batz de Trenquelleon, under the guidance of Father Chaminade and Bishop Jacoupy of Agen, inaugurated the group of religious sisters called the Daughters of Mary Immaculate (Marianist Sisters). Similarly, in 1817, a group of men formed the first nucleus of a men’s religious order called the Society of Mary (Marianist Brothers and Priests). 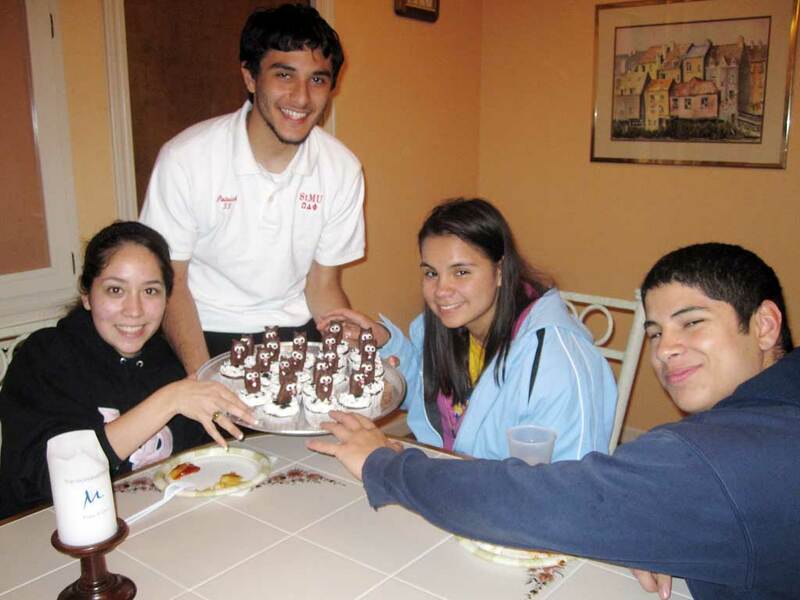 Thus was the birth of the Marianist Family and its three branches—laity, sisters and brothers and priests. This entry was posted on February 2, 2010 at 7:38 pm and is filed under Community News. You can subscribe via RSS 2.0 feed to this post's comments. Both comments and pings are currently closed.